Sydney’s highly awarded brewers, Stockade Brew Co., are setting up shop in the city they love. After purchasing a neglected factory in the heart of Sydney’s micro-brewing hub, Marrickville, they have transformed the space into a fully functioning brewery, tasting room and bar set to open in May. On offer will, of course, be their core range of the 8Bit IPA, the Hop Slicer XPA, the Chop Shop Pale Ale and the Duel Hoppy Lager, as well as a range of limited edition brews. The team has also allocated four taps for rotating guest brewers, such as Bucket Boys and Hop Nation, and will be brewing and aging up to four barrel-aged beers on-site at any one time. This includes the 6.5% Kentucky bourbon barrel-aged IIPA, brewed especially by head brewer Daniel Fardon ahead of the brewery’s launch. The Us Cascade, Citra and Centennial hops used in this beer give it citrus and floral aromas, while the barrel aging provides light wood and bourbon notes. This place aims to be much more than your standard brewery and beer bar, however. “It was equally important for us to create a space that also suits those who might not drink beer, but still want to come out and have a good time,” said Stockade Brew Co.’s Anton Szpitalak. Venue manager Jason Soto has been working tirelessly to achieve this goal, working closely with Urban Winery Co. and a number of Australian craft distilleries to bring together an impressive wine and cocktail list. 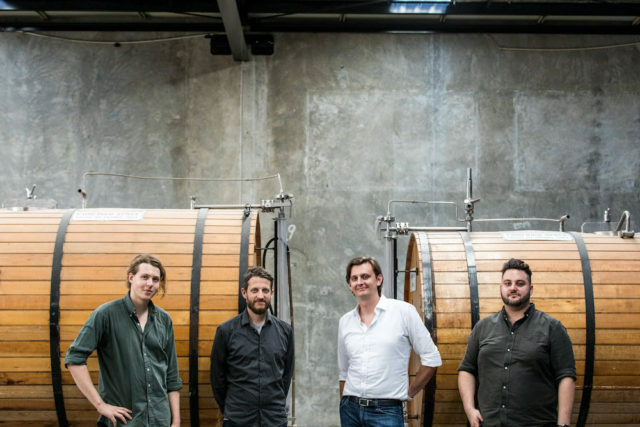 This extends to wines being blended on-site and aged in Stockade’s barrels, allowing the brewery to stamp its mark on the wine offering, and cocktails such as the gin-based ‘Hop Scotch’ or the ‘Old Money Brandy Balloon’ being infused with Stockade’s hops, creating concoctions unique to the venue. For those looking for a bite to eat, the brewery has brought on food truck aficionados Eat Drink Collective to create a line-up of collaborations that will rotate monthly. First up is Baby Rey’s, who’ll be serving up American-style burgers and fries perfect to match with your favourite brewski. The former warehouse space, designed by RAD studios, harmonises art-deco furnishings with the industrial atmosphere through features like steel screens and wooden furniture. A bespoke bar has been built from Stockade’s own repurposed barrel staves which opens up to a communal dining area fit for 250 people. There is also an intimate tasting room, which caters for up to 14 guests, where tasting sessions, cocktail masterclasses, butchery masterclasses and beer and cheese pairings will be held. The brewery, tasting room and bar are the brainchild of Stockade Brew Co.’s Anton Szpitalak, who first launched the company in 2015.